Cardamom (Elachi) – 1 no. 1. Grind the ingredients listed under ‘To Grind’ with little water to a semi fine or fine paste. 2. In a pressure cooker, heat oil and add cardamom and jeera. When jeera sizzles, add onions and curry leaves and fry until onions turn light brown. 3. Now, add chicken pieces and turmeric powder. If you want it to be spicy, then add chilli powder. Saute for 2 minutes and then add the ground paste. 4. Saute well till raw smell leaves say for 3-5mins. Then add water, required salt and pressure cook for 5 whistles. Once pressure releases, open and serve hot. Now, the Chicken Soup is ready! This entry was posted in Non-Vegetarians on November 20, 2014 by vikashbhardwaz. I learned this recipe from my mom. She makes this Fish Fry almost every other day. Whenever I have lot of work to do and have no time in the kitchen, I make this Fish Fry. My husband loves this recipe so much. 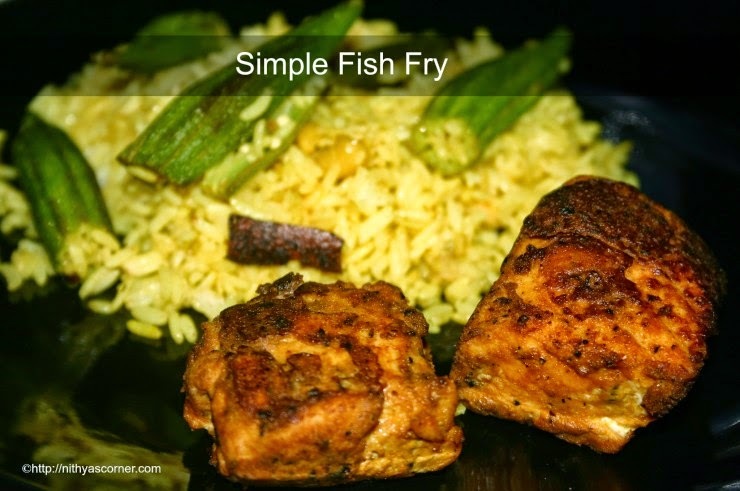 Some of my friends who have tasted this recipe loves this Fish Fry so much. Fish slices (any fish) – 5 nos. 1. In a mixing bowl, put turmeric powder, chilli powder, black pepper powder, lemon juice, and salt. Mix the ingredients using little water. Add the fish to the mixing bowl and marinade for 15 minutes. 2. Heat oil for deep frying. Then, either drop fish one by one in the oil and deep fry it or else put 2 tablespoon of oil in a dosa pan, and shallow fry the fish. I have shallow fried the fish in a dosa pan. 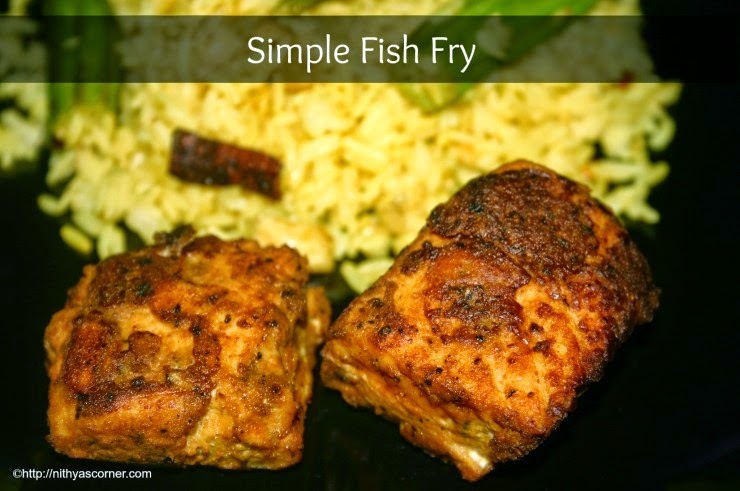 Now, the Simple Fish Fry dish is ready! 2. You can marinade the fish and refrigerate for half hour. 3. I usually shallow fry the fish using 2 teaspoons of oil. Some prefer to deep fry the fish. 4. When you deep fry the fish, make sure you heat the oil in high flame and when you fry the fish, deep fry it in medium flame.